Special Counsel Robert Mueller unsealed charges on Oct. 30 against Paul Manafort and his business partner Richard Gates related to lobbying work they did from 2006 to 2015. According to the indictment, Manafort and Gates did not register as foreign agents while lobbying on behalf of the Ukrainian government, and tried to hide tens of millions of dollars they received in payments. Both have pleaded not guilty. The case may be much broader, however, and may include related actions of the Podesta Brothers—John Podesta was campaign manager of the Hillary Clinton campaign—and to a uranium deal tied to the Russians that the Clintons, and Mueller, were involved in. The charges arose from Mueller’s assignment to investigate alleged collusion between the Trump team and Russia—which the charges make no mention of. The alleged crimes also took place before Manafort and Gates joined the Trump campaign. 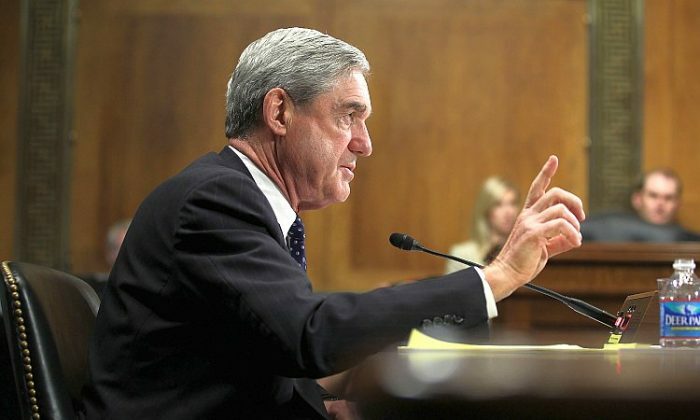 Mueller unsealed his charges while under pressure to resign over conflicts of interest with the Russia investigation—due to his role as FBI director while overseeing a Russian uranium deal. Central to this campaign was the Russian acquisition of mining company Uranium One between 2009 and 2013. Former President Bill Clinton received $500,000 in speaking fees from a Kremlin-linked bank tied to the deal, the same month the deal was approved, with former Secretary of State Hillary Clinton serving on the committee that greenlit the deal. Russian investors linked to the uranium deal also donated over $10 million to the Clinton Foundation, according to an April 2015 report from The New York Times. In Sept. 2009, Mueller flew to Moscow to provide Russia with a sample of 10 grams of highly enriched uranium (HEU). A cable released by the information-leaking website WikiLeaks shows that Embassy Moscow “requested to alert at the highest appropriate level the Russian Federation that FBI Director Mueller” was making the delivery. Around this time, Manafort was working closely with the Podesta group, and, according to Fox News, while the Podesta Group was working closely with the Clintons, Manafort was acting as a liaison between Russia and the Podesta Group. Mueller has issued grand jury subpoenas seeking testimony from public relations executives of the Podesta Group, according to NBC News on Oct. 25. It is unclear, however, if the subpoenas mean Mueller plans to charge the Podestas, or whether he will grant them immunity to testify. Tony Podesta, brother of former Clinton campaign manager John Podesta, has lobbied Washington on behalf of Russia’s biggest bank, Sberbank, according to the Panama Papers, and was also a top campaign bundler and contributor to the Clinton campaign. John Podesta has his own ties to Russia. While the Uranium One deal was going through, a report from the Government Accountability Institute said that in 2011 John Podesta had joined the executive board of a small energy company called Joule Unlimited, and two months after he joined, the Russian government poured close to $35 million into the company. The funds came from a Russian government investment fund, Rusnano, started in 2007 by Russian President Vladimir Putin.